While in Washington, D.C., the law school’s Afghan LL.M. 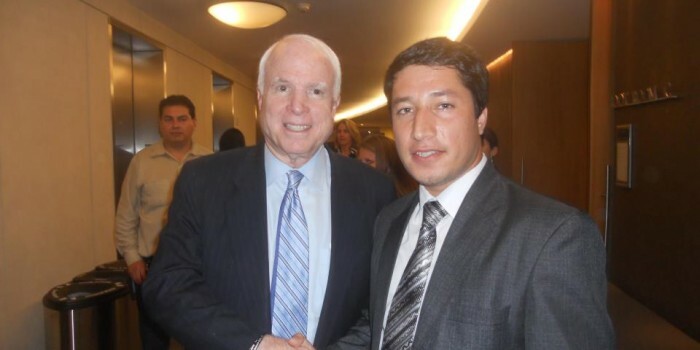 candidate, Yama Keshawerz, was invited to attend a speech given by Sen. John McCain (R-Ariz.) about Afghanistan at the Carnegie Endowment for International Peace. “It was a great event and the event was attended by many,” Keshawerz said. Keshawerz is the law school’s first Afghan student. Keshawerz came to Wake Forest as a scholar from the Public-Private Partnership for Justice Reform in Afghanistan (PPP). Keshawerz led a discussion in the fall semester titled “Afghanistan after 9/11,” as part of WFU Law’s LL.M. “Lunch and Learn” series, and continues to be an active student in the law school community. The law school is looking forward to host another Afghan PPP scholar for the upcoming 2012-2013 school year. In 2011, WFU Law was certified as a host institution for the PPP, established by the U.S. Department of State and leading private attorneys in the U.S. The PPP is a prestigious academic foundation supported by Secretary of State Hillary Clinton and former Secretary of State Condoleezza Rice and offers scholarships, training, and other educational resources to Afghan prosecutors, judges, defense lawyers, advocates, and educators. The annual Washington, D.C., trip to attend a U.S. Supreme Court hearing is a part of the required LL.M. course, “Introduction to American Law.” This course provides an overview of various areas of American law, of the U.S. legal profession, and of the U.S. judicial process. It is a basic introduction to the common and statutory law of the U.S. federal and state systems of law. The U.S. Supreme Court hearing is integral part of this course as it allows students to observe the highest court in the United States. Students also take tours of the U.S. Supreme Court Courtroom to explore some of its symbolism, as well as to see interesting “behind the scenes” areas, such as conference rooms.